It is well-known that education has a two-way linkage with the life of people in any social context. It is expected to contribute to the various economic, cultural and political aspects of life. At the same time, the existing socio-economic conditions may determine educational outcomes – enrolment, retention, and learning achievements in the broadest sense1. Some remote parts of the world, such as Amazonia and Borneo have very different, local patterns of livelihood which are least integrated with the outside world2. There are population groups which have been living there for generations, and some of them from even before the arrival of the European colonial rulers, like the various indigenous groups in Amazonia or tribal groups such as Dayak in Borneo. They have developed livelihood patterns and social and cultural practices which have enabled their long-term survival in these localities. This kind of dependence on local natural resources for subsistence can be seen in many other parts of the world (for example, the arctic regions) and even in parts of India, like many north-eastern states and the forested regions of central India. There can be a migration of people from these remote regions to cities or other parts of the country, the specific issues regarding this too we will discuss here, later. But for most people in these remote parts, migration may be an inferior option, and so, the continuation of dependence on local resources for subsistence, the persistence of socio-cultural practices and the remoteness may have implications on both, the supply of and the demand for education in within these communities. The overall improvement in the economic situation of the countries in which these parts are located has enabled the governments there to address some of the issues related to the supply of schooling but not all. One of which is the scarcity of qualified persons within these localities to take up teaching (especially in higher grades) and qualified teachers from outside may not prefer to be there for prolonged periods to teach. Also, the demand for education is influenced by the job opportunities available to the educated people. The absence or slow pace of industrial or urban development in these regions limit these opportunities. For these reasons, it is interesting to see the challenges in achieving `quality schooling for all’ in these and other remote parts of the world. At the Azim Premji University, we have been assessing the challenges in the education of the indigenous people, and as part of this project, we carried out a short-period fieldwork in Amazonia. 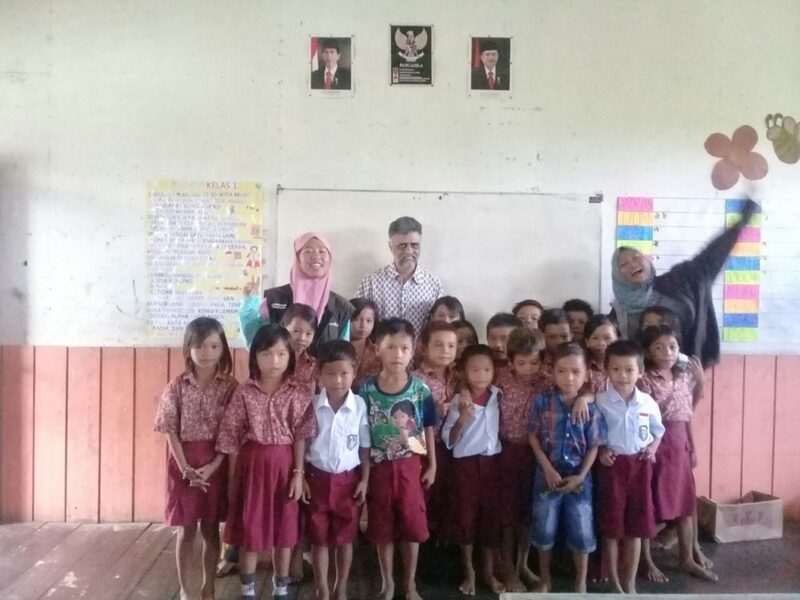 Another project – to study the factors that enable the schooling and work participation of girls in Indonesia – facilitated a field study in the Indonesian part of Borneo. During these studies, we could see certain common characteristics in terms of educational challenges in both these regions, that is, Amazonia and Borneo, which is the empirical basis of this report. Briefly, Amazonia is a large forested region covering Brazil and a number of other countries in South America. This is an area which has the maximum number of indigenous people in Brazil. The Amazon river and its tributaries shape the lives of these people. Though there has been industrial and urban development in parts of Amazonia, there are also many remote settlements which can be reached only by boat. People in these settlements survive on locally available resources, which we discuss in a little more detail in the following sections. Borneo is a major island located in South-East Asia and shared by three countries – Malaysia, Indonesia and Brunei. A sizable part of Borneo is covered by forests. Rivers originating from these forests, though not as big as the Amazonian rivers, are the lifeline of the communities there. There are roads but the ones connecting to the rural settlements are not well developed, and travelling to major cities in the region (for example, Tarakan in the North-eastern part of the Indonesian Borneo) is easier through rivers and other waterways. Reaching major cities takes hours by boat, or days by road. There are airports in a few small towns within the region but air travel can be expensive. Compared to Amazonia, the economic activities in Borneo are more integrated with the outside world. Though there are areas open for immigrant settlement, commercial agriculture, mining and other activities in both these places, these are more widespread in Borneo. There are also similarities between Borneo and Amazonia in terms of the food habits and other aspects of socio-economic life that are discussed here. We categorize the educational challenges encountered in these regions into those related to the provision (or supply) of schooling, and factors affecting the demand for education. There are a number of factors in both these countries which have enabled the provision of schooling all over the country, including the remote parts. Both these countries are categorized as middle-income, in terms of the Gross Domestic Product (GDP), and their status in the Human Development Index (which is also higher when compared to India and other poorer countries located in Africa and other parts of the world). Parts of these countries have been industrialized following open economic policies, including those allowing foreign direct investments and liberal export-import regimes. Both Brazil and Indonesia are net exporters of petroleum fuels. For these reasons, the governments of these countries are able to mobilize substantial public resources to be used for social expenditures, like education and health-care. Both these countries are democratic and there has been a deepening of the democracy and the enhancement of political participation by different sections of the society in the last two to three decades3. These changes have made the governments of these countries responsive to the needs of almost all sections of their people. Hence, the resources flowing to the people living in different parts of the country including these remote settlements have gone up, and that is reflected in the availability of educational facilities there. Improvements in schooling have taken place in both these parts of the world. The developments in the education of the indigenous people in Brazil are described in detail here. The provision of schooling has improved significantly in Amazonia during the last two decades. Most settlements have access to an elementary school (grades I-IX); the infrastructure in the schools has improved; and, the number of teachers has gone up, with a majority of them from the local indigenous groups. Though all of these teachers may not have acquired teaching qualifications, significant progress has been made in this regard too through the special teacher-training programs carried out in the federal universities. During our fieldwork in the selected communities, we could see all this improvement. To a great extent, this is true for Borneo too. There are elementary schools in most villages with improved infrastructure and there are a number of teachers in every school, though there are a few vacant positions. A sizable number of these teachers also come from the local communities. This investment in schooling has led to an improvement in the enrolment in primary schools and the rate of dropouts in the lower grades has come down drastically. The basic improvement in the life situation (with minimal or no food poverty; availability of primary health care, etc) in these remote parts encourages parents to send their children to school. Despite these improvements, there are a few challenges in the supply of quality schooling in these parts of the world. Even with the gradual increase in the number of trained, local teachers, there is a scarcity of well-qualified teachers and they have to depend on those from the other parts of the country. There are difficulties in attracting teachers from outside. This is one impact of the `remoteness’ on education. Not many outsiders with higher levels of education may be interested in living in these settlements. Even if they take up these positions, they are on the lookout for opportunities to get away from these remote areas as soon as possible. This reduces the availability of well-qualified teachers in higher grades because of which the provision of secondary schooling becomes a problem. One way to deal with this is to set up higher-grade schools in a few smaller towns that can cater to a larger but more scattered population from these settlements. But this will require commutation or residence in these towns which will bring with it the associated financial, cultural and psychological costs. Alternatively, strategies such as online teaching may have to be used and this is being tried out in parts of Amazonia for the higher grades. However, it can have an adverse effect on the students’ interest and quality of learning. The fact that people in these remote areas speak their own language and dialects that are different from the national language (Portuguese in Brazil and Bhasha in Indonesia) could be a potential challenge in the education process. There have been a number of changes in this regard. First, the past policies of imposing the national language (and nationalization) on these communities has created a set of people in both these settlements who speak the national language. This language integration or homogenization is at a higher level in Indonesia. However, the communication within communities and households continues to be in the local dialects/languages. There have been efforts towards bilingual, multi-cultural and inter-cultural education in Brazil, and as mentioned earlier, there were specialized training programs for the teachers belonging to the indigenous communities, which have addressed the language barrier to some extent in the primary grades. This is discussed in detail here. Hence, we did not see language as a major challenge for the educational achievements in these settlements. As noted elsewhere (Santhakumar et al, 2016), the educational achievements of a set of people depend not only on the availability of schools but also on the willingness on the part of parents and students to acquire education. There are certain socio-economic factors which seem to influence the demand for education in Amazonia and Borneo. These are discussed next. In both these regions, the lives of the indigenous or native people depend on the locally available natural resources. Their dependence on national or international markets for basic goods, like food, is minimal. There is no serious `food poverty’ in Amazonia or Borneo under normal circumstances. In most parts of Amazonia, nature continues to be bountiful and abundant. People’s diet comprises of three major items – products made from Cassava root which is grown in the `firm ground’ of the region; a variety of fruits from trees and plants, Acai being the most popular; and fish from the majestic Amazon and its tributaries. These continue to be available despite the deforestation, unplanned development and industrial extraction. The low population density (for example, 2.5 per square kilometre in the Amazonia state of Brazil) ensures this per-capita availability of food. Incidentally, the basic livelihood pattern of the people in Borneo has striking similarities with that of those in Amazonia. This is not surprising since climatic features – chiefly driven by the distance from the equator – are similar in both these places. Cassava is the main staple food in Borneo too. 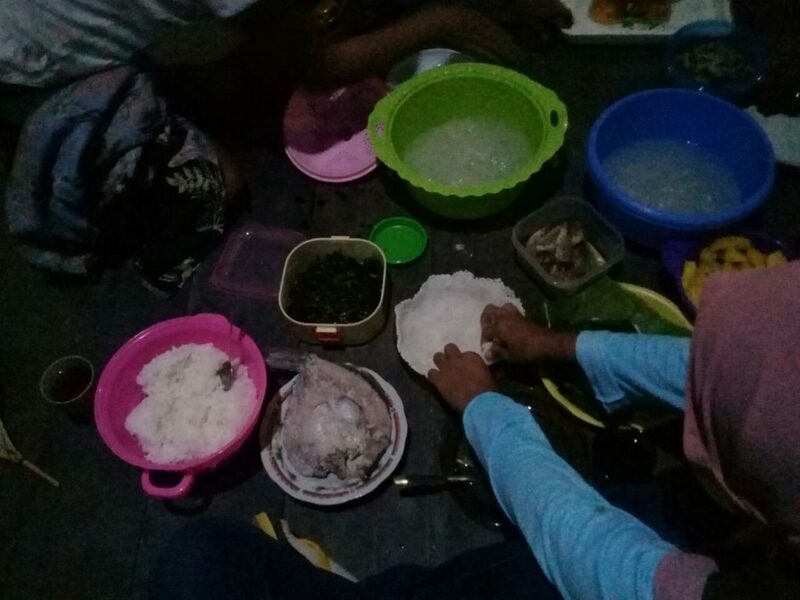 Rice is also consumed but it is not the main staple food, even though it is the main source of carbohydrate in most other parts of Indonesia. The rivers in the region, though not as majestic as in Amazonia, are part of the subsistence livelihood. They provide water, fish and support services, like transport. There are local plants and fruits like banana and pineapple (which are also available in Amazonia). Hence, there is no major scarcity of food in Borneo too, even without the incomes that people get from the government or other external sources. Although both these locations are populated mainly by the indigenous or tribal people, there are also immigrants in these regions, for example, the Government of Indonesia brought and settled people from other parts of Indonesia in Borneo as part of a resettlement program. There are such settlements of immigrants (not only from other parts of Brazil but also from other countries, such as Japan) in Amazonia too. However, the focus of this article is on the settlements of the indigenous people. Some notable social characteristics of the indigenous people in these regions have a significant impact on education. There is no major structural fragmentation like that between landowners and landless agricultural workers among these people in both Amazonia and Borneo. They accord a relatively higher value to female labour, and so, women participate in most of the livelihood activities. There is no reluctance to send girls to schools (though early marriage may affect schooling in higher grades – an issue we discuss later). These factors – the absence of social fragmentations (like a caste system) and the higher valuation of female labour – facilitate a fairer distribution of welfare among people even with the limited resources available. In both these regions, the people have access to land or forest for their sustenance. Even when they do not own land privately, they have access to land for cultivation and also to a wider stretch of forests for the collection of food and other materials. This access is mediated through the communities and sanctioned by the government. Hence, landlessness is not a problem in both these regions. There are also other enabling factors, like Amazonia which is huge and has a long stretch of borders with different countries, requires a border protection force which can withstand the difficulties of the terrain. The grown-up boys from these communities are inducted into the defence forces and they get a pension after serving in the army for a decade or so. There are other governmental schemes which provide financial support to others, such as, the aged. Parts of the forest land is opened up for palm-oil cultivation in Borneo. There are companies which manage plantations, and they pay a rent to the local people. The Indonesian government also provides financial resources to these communities for various purposes. The economic development of both Brazil and Indonesia and the political transitions in the past have encouraged the respective governments to improve the conditions of people living in the remote parts of their countries. So, overall, the basic subsistence for these people is ensured in both these countries. The description so far should not give an impression that life in these regions is easy and comfortable. Though food is not scarce, the scarcity of safe drinking water is an issue, especially where the rivers have high levels of pollution. People in Borneo use rainwater harvesting for drinking and other domestic purposes but it is not sufficient during certain seasons. Then, they are forced to use the river water. Water treatment systems do not exist in all villages. People in Amazonia buy and transport drinking water in cans for their daily use. Though electricity connections exist, the supply of electricity is erratic in both Amazonia and Borneo. Travelling to cities can take one to many days by boat from these settlements in both the regions. Though there are primary health centres near these settlements, diseases or medical conditions which require hospitalization and consultation with specialists may necessitate travelling to and staying in cities, which is expensive. Though child-delivery has been happening within these villages with the help of traditional midwives, there is a growing trend (which is desirable in order to reduce infant and maternal mortality) to use hospitals for this purpose, and the expenses in this regard can be substantial. There is a choice to migrate, especially to other regions and cities located within the country and there are people who migrate, and hence one can see settlements of such indigenous people in cities like Manaus and Belem in Amazonia, or in Balikpapan and Tarakan in Borneo. However, the fewer chances of having a `good’ life in the cities may make this migration an inferior option. Historically, people in these settlements have not been exposed to higher levels of education, hence, they are less likely to benefit from jobs which require higher education and may end up doing unskilled or semi-skilled work in the cities. The low income, coupled with the not-so-desirable living conditions (due to the cost of housing and other amenities) make the life of migrants from these settlements in cities unattractive. On the other hand, life in these village settlements is not uncomfortable due to the absence of food poverty even with lower levels of income. The cost of housing is not expensive in villages due to the access to forests for building materials. The houses are made of wood and constructed on platforms built on wooden stilts to ensure protection from snakes and minor floods which are common in these areas. Wood-based construction is also able to withstand earthquakes. Therefore, unlike in the other parts of the world, there is no major incentive for the adults of these communities in Amazonia and Borneo to migrate to become workers and residents of urban slums. Moreover, there is a normative discourse among these communities against such migration and a valorization of the life in their nature-dependent settlements. Elders in the community discourage the migration of youngsters. Even those who go to cities for higher education prefer to come back to their own communities, which could be partly due to the difficulty in getting attractive jobs in the cities. This situation, combined with the absence of enough job opportunities for educated people in their settlements, can influence their `demand’ (or the willingness to spend time and effort) for education and that is discussed in the following sections. There are not enough opportunities for educated people in these villages for various reasons. There are not many industries close by, and the only economic (commercial) activity is the plantation of oil-palm in Borneo. Similarly, the processing of acai fruit and fishing are the small-scale commercial activities in Amazonia. Among the most important reasons why it may not be desirable to promote large-scale industrialization in these regions is that these are the major rain-forest covers which remain in the world, and their protection is important for the conservation of global biodiversity. These limits on industrialization affect the process of urbanization too. In the absence of industrial and service sector jobs, people with higher levels of education remain unemployed if they are not willing to migrate to the bigger cities. The jobs available to educated people in these villages are mainly in teaching, which is facilitated by the financial support provided by national/provincial governments. Because there is the social and political compulsion to hire teachers locally irrespective of their qualifications and aptitude, it can lead to the recruitment of persons not adequately motivated to teach. The scarcity of jobs disincentivizes boys and girls to complete education, especially, the higher grades. They may not see any significant benefit from it and may find the available unskilled work more attractive. These young adults exercise their own choices and are not under the compulsion of parents or teachers, so nothing stops them from dropping out of school. Parents too may not attach importance to education for the same reasons – the lack of job opportunities. This adversely affects the demand for quality education at higher levels, and the educational achievements at school. It is a vicious circle where the general under-achievements in education affect the educational quality of people who want to be school-teachers from these localities, which in turn affects the quality of instruction in schools. All the factors mentioned above – sustenance based on local nature, the unattractiveness of migration as an option, low demand for educated people within the region – create a situation where the socialization and mate-selection between girls and girls happens within close circles (within or across villages which are not far from each other). In both these regions, girls and boys select their sexual/marital partners on their own and their parents get involved only at the time of formalizing the marriage. As noted earlier, there is no major gender discrimination in the enrolment at the primary level in schools. The absence of opportunities for educated people may encourage boys and girls to have sexual/marital relationships at a relatively younger age (while in school) because they are not concerned with its possible negative implications on education and educated employment. Sexual relationships leading to pregnancies among girls of 15-18 years of age further impede the continuation of their education in higher grades. There are practices of bride-price and patrilocal residence in Borneo, which too impact the education of girls. On the one hand, bride-price encourages the parents to send their daughters to school as there is an increase in the bride-price4 depending on the level of education of brides5. At the same time, since a girl lives in the husband’s house after marriage, and because a price has been paid for her, the expectations in terms of her labour in farming and other household work are higher. This too works against the education of girls in the higher grades6. Governments provide money to the communities to manage and support schools in both Amazonia and Borneo. Hence, there is a greater control of (or participation by) communities in the affairs of the schools. We could see a close collaboration between the community leaders and the school principal in the school we visited in Borneo. The community showed interest in facilitating the residence of a teacher-fellow appointed by a national NGO, and also the visit of this researcher. They were interested in understanding issues related to education in India as compared to Indonesia. There were concerns about the (lack of) connection between formal education and their livelihood. There are perceptions among the community on the not so desirable nature of economic development and modernization; however, the absence of a strong demand for education is not helping them to resolve these challenges in a manner beneficial to them. Traditional communities have their own ways of organizing collective action for the sustenance of their life. This includes the provision of an education to the younger generations appropriate for their life. However, when the government or an external agency provides money for an activity of the community, it can lead to perverse incentives there. It was noted in the history of South India that when the colonial government started providing money to maintain traditional irrigation systems (which people were maintaining on their own until then), people waited for the external funds to come for the maintenance leading to the degeneration of these systems. There can be instances of corruption too with individuals taking money without using the entire allocated amount for the intended purpose. Similar problems can also arise in these remote parts. Because the indigenous communities are not very interested in higher levels of education, they may not have a strong interest in ensuring that quality education is provided in schools. This may discourage them from monitoring the activities of teachers coming from their own community. The cost involved (including the discomfort) in monitoring a local teacher (to ensure that he/she comes to the school on time, takes lessons with appropriate preparation, and so on) could be higher than the perceived benefits of quality education. We could see local teachers (who live in the same community/locality) coming two to three hours late to schools in Borneo. This is a regular phenomenon, according to the person who is posted in this school by a national NGO. The head-teachers, who are outsiders, may not have enough clout to monitor the local teachers. Given the general laxity in the performance of teachers, both insiders and outsiders may take the tasks of teaching, somewhat lightly. Moreover, outsiders who want to reduce their stay in these communities to the minimum possible time, are more than happy if their actions are not monitored. Ultimately, these are linked to the interest of the community/parents to get a good quality of education for their children. Despite the difficulties in getting jobs for educated people, school education has been found to be beneficial for the people living in these settlements. The age of marriage for girls and boys has been delayed, though it is not yet comparable with that in the other parts of these countries. The fertility rate has come down, even though the number of children per woman is still higher than that in the cities or other regions in both Brazil and Indonesia. The health practices in the communities have improved, which seems to have reduced the rate of infant mortality and morbidity. There are frequent exchanges between the people in these regions with those in the other parts of the country, and one can see the indications of their inclusion in national politics (with them participating in national- and state-level political processes). Yet another important development is the availability of school teachers from these communities. These teachers speak the languages and local dialects of the communities and are familiar with the socio-cultural traditions, and these factors should, theoretically, facilitate the schooling of the children in these settlements. One major limitation that we have seen in Borneo is the absence of adequate provision for early childhood education (ECE). Parents in these communities are unaware of the importance of providing any kind of education to children below six years of age. Though there are financial resources available within the community which can be used for this purpose, there has not been any significant effort in this direction. This could be a serious issue given the research findings that demonstrate the importance of ECE for the cognitive development of children and their long-run development. Yet another issue observed is that the children go to school without having a proper breakfast. The school timings are between 8 AM and 12 PM. People in these communities usually have their breakfast late as they carry a limited packed lunch to their work in farms and forests. However, the attendance of children in schools without breakfast would impact their learning. Meals are not provided in these schools in Indonesia (this may be because there is no food poverty among the population). One character of the remoteness is the heavy dependence on forests or subsistence agriculture. Economic activities are limited and although commercial cultivation has crept into certain parts of both these regions, there are parts which are far away from such activities. Also, certain industrial activities may not be desirable in these areas, and hence industrial development may have to be controlled or prohibited for national and international interests in terms of sustainable development. These would limit the opportunities available for educated people there. Hence, the educated people have to migrate to cities in search of employment. If they do not migrate, people may have to depend on forest-based or other subsistence activities which do not require education. The absence of opportunities for educated employment may reduce the demand for education, especially in the higher grades, or the willingness to complete schooling as a means to acquire higher education. This may also affect the quality of education in higher grades and the educational achievements of students, consequently reducing the availability of qualified teachers from these communities. There can also be an excessive demand for job positions, such as teachers in local schools, among those people from these communities who have a certain level of higher education. What does education mean to these people then? Given their circumstances, there could be a slightly different rationale for the education for these people. Education need not take all of them away from their traditional lifestyle. It need not convert all educated people from these communities into workers in industrial and service sectors. But at the basic level, education is important for reducing the family size and population and improving health practices. These changes are important for sustainability since a higher fertility rate and population may reduce the per-capita availability of resources and may lead to a decline in the quality of life over time. Ashraf, N., Bau, N., Nunn, N. and Voena, A. 2014. Bride Price and the Returns to Education for Women. Santhakumar, V. Gupta, N. and Sripada, R. 2016. Schooling for All in India: Can We Neglect the Demand? Delhi: Oxford University Press.